Our 33rd annual celebration of the fabulous foods of Spain culminates with a two-grill Paella throwdown on Zingerman’s Patio. 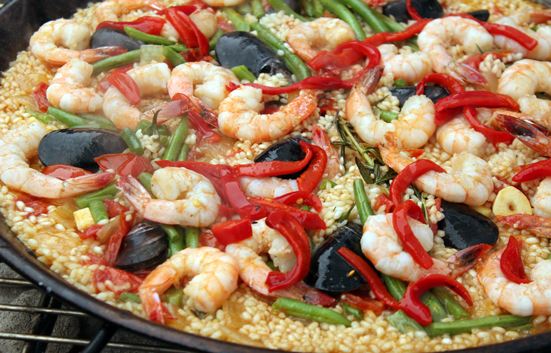 Join us at noon for a step-by-step presentation on how to prepare this prized Spanish dish, then Chef Rodger and his crew deal the goods: three kinds of traditional Paella— Chicken/Chorizo, Seafood and Vegetarian all grilled over mesquite. Zingerman’s Bakehouse is back with their delicious desserts for the festivities: Torta de Santiago and chocolate Miguelitos! And don’t forget the real Valencian-style tiger nut Horchata –RAAAAWR! It’s a tasty trifecta of tremendous proportions – Mark your calendars and come early because one thing is guaranteed—the Paella always sells out!